Cakes and cupcakes are often decorated with fragrant and delicious chocolate frosting that you can prepare at home will not be easy. Options for its cooking there are some for every taste and possibilities. Smash into small pieces tiles of black chocolate, add to a bowl and melt in a water bath. Then add the cream and stir well. Pour the slightly warm cake with glaze, so it does not harden. 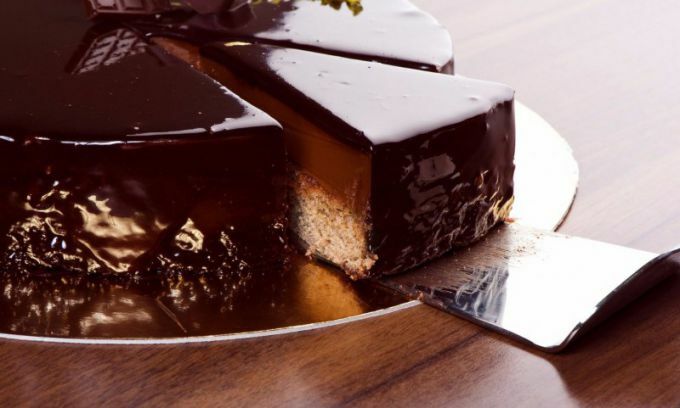 This chocolate glaze is poured the top layer of the cake which has no butter cream. Mix well the cocoa, sugar and milk, bring the mixture to a boil. When slightly cooled, add butter and stir until smooth. Use slightly warm, otherwise it will be difficult to evenly distribute on the product. This frosting is so shiny, it is used in particular for decorating a home "Prague" cake. Thoroughly mix cocoa with sugar and add the sour cream. Put on fire and stir, bring to a boil, then immediately remove from heat. In warm mixture, add the butter and mix well. Use the icing to pour on top of jam or just on the cake, because it is warm and the butter cream will melt. Connect the sugar and cocoa with the water and vinegar and allow the mixture to boil. Then add the butter and stir until it dissolves. Chocolate icing is ready. Pour it in the cake while it's warm. Cold glaze you can make decorations on the cake using a pastry bag. Chocolate icing is also used to decorate pies and rolls with poppy seeds. Chocolate icing made from melted chocolate, used for fruit fondue to dip the fruit pieces and berries, skewered on skewers. This is a wonderful dish for a children's party. Instead of sugar is better to use powdered sugar, with chocolate icing it to cook faster. In chocolate icing on the basis of cocoa powder, you can add the vanilla sugar for flavor.